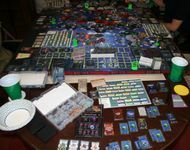 I set up a game for Saturday December 30th with 5 other friends for a full day game. It was very fun and we all had a great time and stopped midway for pizza. I had set up a side table for the proposed agendas, Objectives and Facilites. I used a variant where there are 5 Preliminary Objectives out on the table and you must complete One of them in order to score your Secret Objective. Only 1 can be done and it is the players choice of which one to do. I give out 2 Secret Objectives at the beginning of the game (1 MR and one non-MR objective) and you may only score one of them. The proposed agenda are placed up by each player at the beginning of the game and are the 6 agendas that the political Strategy Card will have to choose from. I use a large mix of Green objectives that start the game out and a mix of all the Stage 1 and Stage II objectives from the game. The Facilities are from an earlier variant that was posted up that I wanted to try out and it worked very well. There are 3 types for different abilities and you have to start with the lower one and work your way up to the better ones building them as you go. The person who runs a Production action will get 3 free and then secondaries get 2 at half cost and all other ways to build facilities also apply as power the facility rules. Nekro was able to get Warsuns early off of Muaat and copy the Letnev Noneuclidian Shielding which made them near unstoppable. We played on my 6 player specialized board. We used Fog of War, Distant Suns, and my variant of Spacial Anomalies. My special set of Strategy Cards as well. It was a very fun day with all players enjoying it and waiting for the next one of 2018. Always room for more if you are in the Chino area, just let me know. Do you mean last play ever of TI3? It is time to move up to TI4; though seeing all the work you put in to get where you are with TI3, it's probably not all that appealing. Nope just last play of 2017. There will be more TI3 this year for my group as we love all that I have done with the game and so far see no need to move forward.